Sapote is a semi-tropical fruit. The flesh inside can be red, orange, orangey-red or greyish. When ripe, the flesh will be scented, soft and sweet. There will be one or more large smooth, shiny dark brown seeds. The fruit can weigh anywhere from 1 to 6 1/2 pounds (450 g to 3 kg.) It has thick, dull, rough skin that can be dull red or dark brown. The Sapote tree is an evergreen tree that will grow true to seed. It can grow up to 65 to 82 feet (20 to 25 metres) tall. Its wood is also used for furniture. The tree can start bearing fruit when three years old. It flowers first with small blossoms. Cultivars include Abuela, Area No 3, Chenox, Copan, Flores, Florida, Francisco Fernandéz, Lara, Magaña, Mayapán, Navidad, Pace, Patin, Piloto, Tazumar and Viejo. Choose firm ones with no blemishes or bruises. Look for a nick near where its stem was where you will get a glimpse of the flesh — look for ones whose flesh isn’t still green. If you do get green ones, you can ripen them at room temperature until the flesh changes colour. Not related to White Sapote or Black Sapote at all. 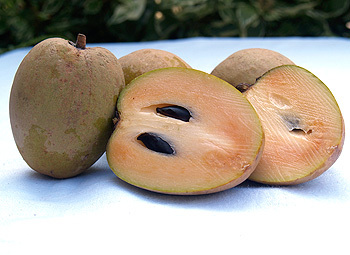 Sapote can be eaten fresh, or in making fruit salads, smoothies, etc. It can be used to make jams, ice creams, sauces — it makes a good purée sauce. The ground seeds are sometimes added to chocolate to give it a bitter edge. Store ripe ones in refrigerator for up to 1 week. Native to lower Central America.